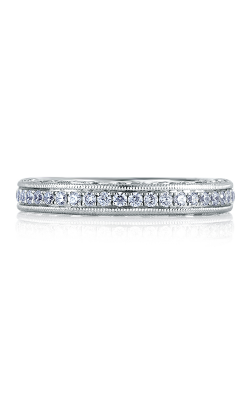 A. Jaffe wedding bands are beautifully handcrafted pieces made with conflict-free diamonds. 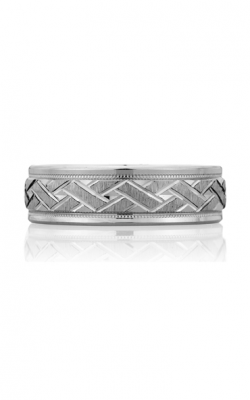 Founded by Abraham Jaffe in 1892, A. Jaffe wedding bands were created with care and detail. The master jewelers at the studio each have over 10 years of experience in the diamond and fine jewelry business and learn from skills that have been passed through the ages. Their jewelry is truly of exceptional quality - all gold is 100% nickel free and the rings are hypoallergenic, perfect for those with sensitive skin. Additionally, A. Jaffe diamond rings are designed with handmade prongs which ensures that your diamonds are secure and that you will be less likely to lose your precious diamonds. A. Jaffe presents several fine collections and designs including the stunning Art Deco collection. This collection includes brilliant vintage-inspired art deco pieces. These stunning rings are graceful and alluring, and feature geometric forms with fascinating and exquisite designs. A. Jaffe's Season of Love Collection features the most charming, luxurious, intricately patterned women's wedding bands. Both of these collections are top of the line in comfort and style. Made to treasure the bond of commitment these beautiful wedding bands feature diamonds expertly chosen and set with extraordinary radiance and shine. In addition to these fantastic collections, A. Jaffe designed the Quilted collection and the Seasons of Love collection. The women's wedding bands in the Quilted collection feature a luxurious quilted inner band and a beautifully brilliant and perfectly balanced center diamond. This collection is perfect for the stylish woman who enjoys bold, brilliant jewelry. The collection features three stone styles as well as halo and sidestone and are made with 18- Karat rose gold, white gold and yellow gold of the highest quality as well as stunning platinum. Kevin's Fine Jewelry is proud to offer A. Jaffe wedding bands at our showroom in Towata, New Jersey. We are a fine retailer of luxury jewelry items that include designer wedding bands and engagement rings, the finest Swiss timepieces, and loose diamonds. We also carry beautiful fashion jewelry, perfect to accessorize your wardrobe. In addition to providing stunning collections, we also offer jewelry cleaning and repair services. We proudly serve Northern New Jersey and nearby cities including Wayne, Franklin Lakes, Woodland Park, Little Falls, Paterson, Clifton, Montclair, Fairfield, Montville and Kinnelon. Please contact Kevin's Fine Jewelry Store at (973)-790-8836 for more information regarding our products, sales, and events and visit us online at www.kevinsfinejewelry.com.